We never just install your business security system and walk away. When you choose ADT you can rely on us always being there through one of our business response packages. Each package gives you the confidence that comes with knowing the UK’s biggest security provider is watching over you and waiting to respond if needed. No alarm activation goes unnoticed. With Keyholder Response, we call you and your nominated keyholders when your alarm is activated, so you’re able to respond quickly. With our Police Response package, you get the added peace of mind that comes with knowing that we call the police, as well as your nominated keyholders, if your alarm is triggered. If you choose our Private Security Response we’ll send a fully vetted and industry-accredited response officer to your premises – that’s a speedy response from a dedicated professional for complete reassurance. Your business is your livelihood so protect it with a name that offers security with certainty. 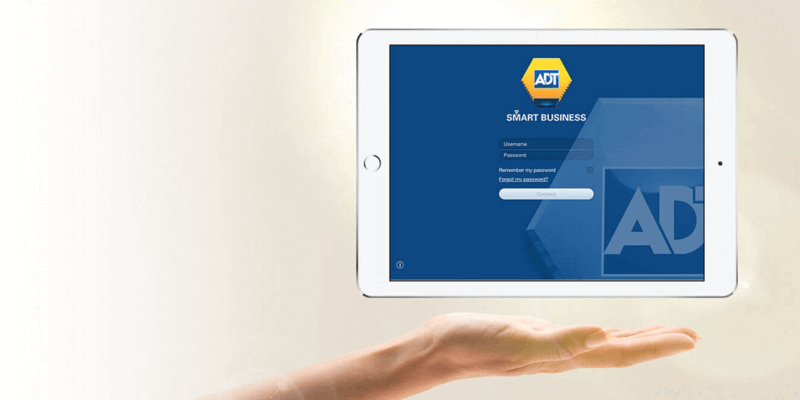 ADT Smart Business keeps you connected and in control of your business and premises, from anywhere. The result is one less thing to worry about, and one more reason to choose ADT. Copyright 2019 ADT Fire & Security plc. All rights reserved. ADT, ADT Always There and the ADT logo are registered trademarks of ADT Services AG and are used under licence. All pictures used are for illustration purposes only and actual products may differ in appearance and specification. *ADT will then respond in an average of 42 seconds of this confirmed activation being presented. Based on figures obtained for January 2017. ^ADT Private Security Response provides you with a first line keyholder in accordance with BS7499. An Officer will respond promptly to your alarm and follow the set agreed procedure as laid out in your contract. ADT Private Security Response services are provided by a third-party, on signing up to these services we will pass your details onto the third party who will arrange a suitable time to attend site to collect keys and complete initial assignment instructions with you. These will include but is not limited to a site health and safety assessment.Service cost for ADT Private Security Response is chargeable at £395 per year, payable annually. This charge includes 3 Private Security Response call-outs in a 12 month rolling period, additional call-outs in this time and additional time spent on-site will incur extra charges, payable monthly as incurred.